I try to get the best deals on everything and one store assists in that better than others — ALDI! If my grandfather were alive to read this post, he would laugh and say he knew all along. We made fun of him many years ago for shopping at some unknown store and coming home with no-name random items, including a backyard pool. Well, I’ve learned he was totally right, and now it’s a go-to store for me. Although I don’t buy everything there, it satisfies a majority of the items on my list. Seriously, the prices are way lower than my grocery store down the street. 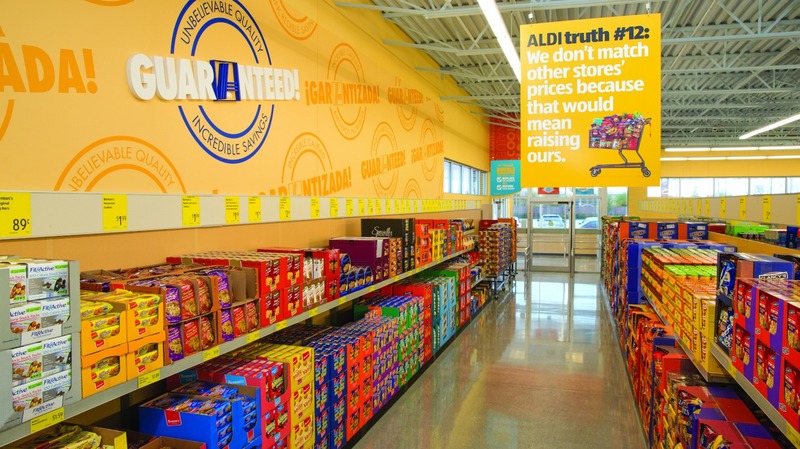 In fact, after ALDI moved in, that store reduced some of its prices in order to compete. My favorites included the Happy Farms line of cheese: $1.99 a brick. I can also make a lasagna for half the price of the grocery store. For toiletries, they have the best deal on toilet paper and paper towels. I’ve compared prices with sales and coupons at other stores, and believe me, buy it here. And for my favorite policy (though I have never used it), ALDI offers a double guarantee: “If for any reason you are not 100 percent satisfied with any product, we will gladly replace the product AND refund your money.” I can get behind that. A lot of the food is actually white labeled — meaning it’s produced by a major company and just branded as ALDI’s. Rumors have it the chicken is actually Tyson and some of the products are Trader Joe’s (ALDI’s sister) or Wegmans (my other love). Aside from the white labeling of products, there are several products that, to me, are not only a better buy but taste better. Examples include the entire line of Clancy’s chips — I put these out at a party, and people asked where they could get them — at around $1. I’ve now ditched Tostitos! I’ve also swapped out other name brands my husband claims are the best, and he hasn’t noticed the difference. Take chocolate (imported from Germany), which is my favorite — ALDI’s surpasses Godiva and Lindt, in my opinion. Specially Selected is their line for upscale products such as fancy olives, crackers and cheeses. Upscale here means slightly more expensive but still not as much as other stores. For bacon, ALDI is the only place I can find nitrate-free at a reasonable price. On an average shopping trip, I am in and out in 15 to 20 minutes, depending on how well prepared my shopping list is. ALDI typically stocks one kind of product for each category. This allows the stores to focus on the best offering and do it with no frills. You won’t find free samples or crazy endcaps pushing promotions. The approach is straightforward: Most of the products are still in the boxes in which they were delivered, they don’t offer bags to help you carry stuff to your car, and there are only six to eight employees working at any given store. All of this keeps overall costs down. If you bring your own bags (or recycle a box from around the store) and don’t need brand names, this is the place for you. Looking for a jewelry organizer that hangs in the closet, I went to T.J. Maxx and Marshall’s a few times and was too cheap to pay $15 for them, so I put it off. One Sunday at ALDI, I saw what I needed in the aisle of random things — ALDI Finds — and it was $6, more than HALF OFF! So now I check this aisle every trip, and today for $7.99 I bought two serving bowls that look like the ones at Bed Bath & Beyond I had been eyeing. Their Crofton line of dinnerware is classy, sturdy and dishwasher safe. Today’s ALDI Finds had a selection of items ranging from desk organizers to solar lights to undershirts. I know the main reason you have stayed away is the cash- and debit-card-only policy. Well, have no fear, they now accept all major credit cards. And for me, this means no longer leaving items behind after realizing at the register that I don’t have enough cash. Although I can’t pull out my coupon folder, I can still upload my receipts to Checkout51, which usually has cash back on fruits and vegetables, so I can save a few extra bucks a month. So, if you’ve been staying away from ALDI, I hope you reconsider. I’ve seen bloggers claim to feed a family of four on $100 a week here, and I 110 percent believe them. This store is worth adding to your weekend routine — you won’t be disappointed!